The Russian submarine, Yuri Dolgorukiy, was passed into service during its inauguration at the Sevmash shipbuilding company in Severodvinsk, Archangelsk Region on Jan. 10. This indicates that Russia is finally aware of the need for a powerful and effective navy. 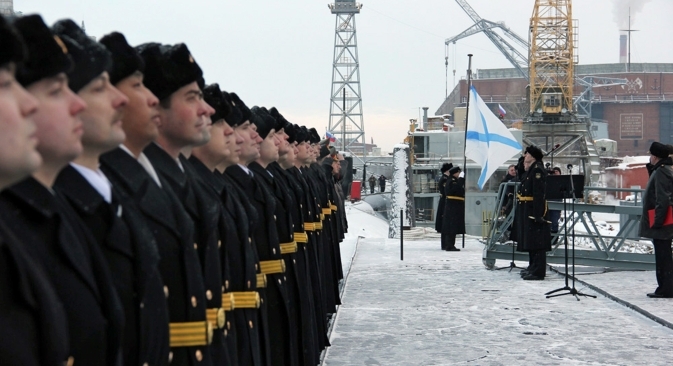 Two landmark events took place during the final days of 2012 and in the begining of 2013 at the Sevmash shipbuilding company in Severodvinsk of Archangelsk Region. To begin with, the navy was presented with the first Project 955, nuclear-powered, Borei-class, ballistic missile submarine, which was put into operational service on Jan. 10. The submarine is equipped with 16 Bulava-30 strategic missiles (NATO reporting name SS-NM-30), which each carry 6-10 nuclear warheads – multiple independently targetable re-entry vehicles (MIRVs). The submarine is named after Yuri Dolgorukiy, the founder of Moscow. Then, on the same day, a second ballistic missile submarine, Vladimir Monomakh, was set afloat. A third, slightly longer Borei-class submarine, Svyatitel Nikolai, will be set forth soon. There is an important reason why the new submarine will have a longer hull: Svyatitel Nikolai and other ballistic missile submarines to follow will carry 20 Bulava-30 MIRV missiles, instead of 16. The new project is codenamed 955A, as an upgrade from the original 955. The rest of the submarine will remain the same. Russia hopes to have at least four ballistic missile submarines operational in the next three or four years. These submarines will carry 68 missiles in total. The Vladimir Monomakh has already begun mooring and sea trials, and another 955 Borei-class ballistic missile submarine, Alexander Nevsky, is also expected to be commissioned. By 2020, Russia plans to have eight ballistic missile submarines carrying a total of 148 Bulava missiles. They will be added to the Project 667BDR Kalmar (Delta III) and Project 667BDRM Delfin (Delta IV) submarines. According to Cmdr. Viktor Chirkov of the Russian navy, the eight Borei-class submarines, the 885 Yasen-class nuclear-powered submarines (the first of which is called the Severodvinsk and is expected to be put into service in 2013), modernized Project 949 Granit submarines (which included the sunk Kursk submarine) and heavy nuclear-powered missile ships from the Project 1144 Orlan (including the flagship of the northern fleet, Pyotr Veliky) will form the base of Russian strategic deterrent forces. The commander-in-chief said in a recent interview that aircraft carriers should make up the core of the deterrent forces. “A new generation aircraft carrier must form the basis of these forces, together with the foreign-built amphibious assault ship and helicopter carrier (the French Mistral),” Chirkov said. He explained that, unlike the heavy aircraft carriers of previous generations (such as the Admiral Kuznetsov), this must be an all-new versatile combat ship with an increased deadweight. It will be armed with manned weapons and drones that will operate in the air, on the sea surface, underwater and possibly in space. The effectiveness of these ships will depend on the availability of aerial picket and guidance aircraft in their air groups, along with the armed reconnaissance drones. The navy commander stressed that plans to create aircraft carriers involve not only the design and construction of the ships. “We are planning to create a full-scale sea aircraft-carrying complex, which will include ships, stationing sites with the requisite infrastructure (including social facilities, aircraft, and training center for ship and aircraft crews), as well as other components. We must provide the basis for the creation of the sea aircraft-carrying complex by 2020,” said Chirkov. The core of the surface naval forces of Russia, at both far and short ranges, will be formed by Project 22350 and Project 20380 frigates and corvettes and their modifications. Some of these are being developed at St. Petersburg and Kaliningrad shipbuilding companies. “They will be replaced by modular design ships equipped with a broad range of robotic tools,” said Chirkov. In his words, a new class destroyer with an increased combat and defensive potential – including anti-ballistic missile potential – will become the main ship in the ocean zone in the medium term. Chirkov also revealed that the first ship of this kind will be the advanced harbor defense corvette. “The ship is already under development. It will perform a wide range of functions normally required in coastal regions and currently fulfilled by ships and other forces and facilities. It will have anti-submarine, anti-mine, anti-ship and air defense capacity and be capable of laying mines and providing fire support for assault forces and land troops in coastal areas,” the commander said. Chirkov explained that the corvette is a phase in the process of the navy transferring to modular ships of increased deadweight. The approach toward module construction and robotic automation of combat systems that were originally developed for the harbor defense corvette will later be applied to other ships, creating the future image of the Russian fleet. During the second development phase (from 2021 to 2030), the navy hopes to complete the creation of and put into active service weapons based on new physical principles, as well as to create a new generation of advanced weapons for the general purpose naval forces. Also, there are plans to commission ship-based early-warning aircraft, unmanned ship-based aircraft, and an advanced complex of ship-based aviation. “This period will see a transition to optionally-manned aviation (including on the basis of modern manned aviation complexes), whereas the aircraft of the old fleet will be replaced by advanced multi-purpose aviation materiel and weapons, including unmanned aircraft,” Chirkov said. It is hard to make plans for the period after 2020. Will the Russian shipbuilding industry manage to perform these tasks? It is important that Russia is finally aware of the need for a powerful and effective navy, so there is hope that Cmdr. Chirkov’s plans concerning the future of the Russian navy will pan out.